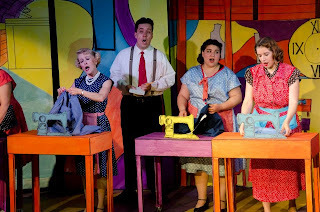 There are some musicals that many of us, even theatre folks like myself, have never seen, and "The Pajama Game" is one of them. Debuting on Broadway in 1954, it's best remembered in theater history as the show that helped launch a young choreographer named Bob Fosse. Dig deeper and you'll find out the show's understudy later went on to be well known on her own, a young Shirley MacLaine. But, over at Musical Theatre Southwest the musical is being given new life in their black box performance space. Jessica and David Aubrey, a real life husband-and-wife team, play the show's lead couple, which allows their natural chemistry to shine as Babe, the head of the grievance committee, and Sid, her new boss, find their affection for each other. If Babe's values seem fairly normal by today's terms, imagine how forward thinking she must have seemed to the original audiences, and Jessica's interpretation allows for her to remain true to the era while also pushing the boundaries of what '50s society expected of women. Reminiscent at times of an early Mad Men throwback in costuming, David's version of Sid remains likable and amiable, despite being pitted as representing the out-of-touch administration at the Sleep Tite pajama factory. Directed by Terry Davis, with musical direction by Lina Ramos, the plot centers around the wage war between workers and administration, with a book and score composed by Richard Adler and Jerry Ross, based off the novel 7 & 1/2 Cents. If the rallying cry for union workers to stand against the establishment seems a bit antiquated to today's crowd, it is the show's charm, as well as the music and movement, that makes it appealing, if somewhat thematically dated. 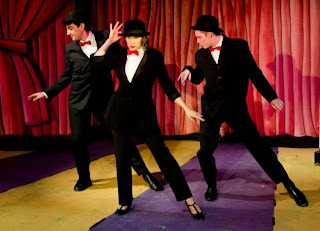 Luke Loffelmacher created his Fosse-influenced choreography to shine through for the "Steam Heat" dance number, one of the show's iconic moments. Performed by Elizabeth Rathburn, Jonathan Ragsdale and Bernie Salazar, the number opens the second act, and is one of several stand-alone moments, where the music and the movement are completely unique to the rest of the show. 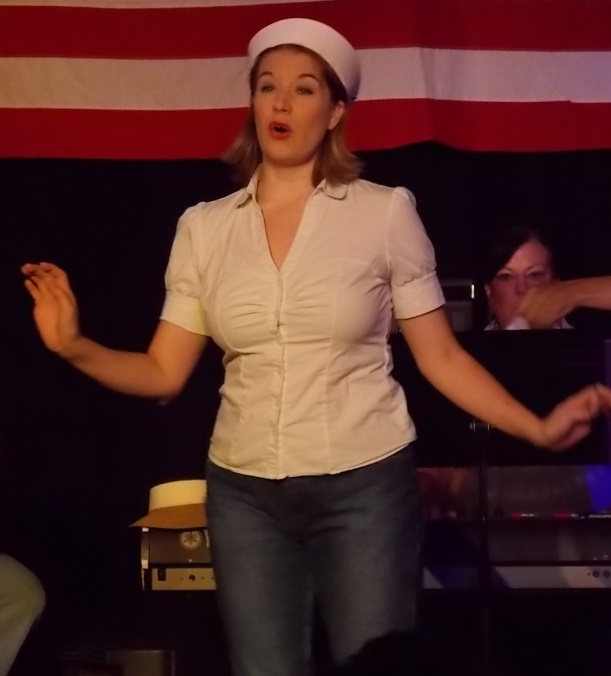 Another stand-alone moment built into the show is "Hernando's Hideaway," sung by the character Gladys and played by Janine O'Neill. 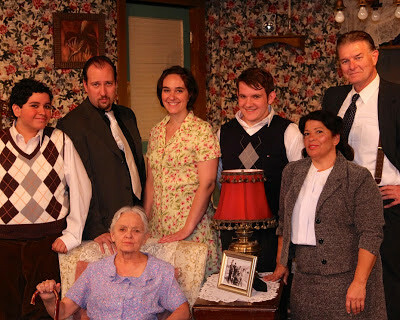 Janine finds her way through Gladys' many unpredictable shifts with a sense of believability that speaks to her natural talent as a comedic actress, and delivers a strong vocal performance throughout. Other strong character actors are peppered throughout the play, such as Kathy Wimmer's Mabel, and Prez, played by Warren Wilgus, whose character perplexed me the most. Only in the '50s would adulterous, philandering affairs be presented as a comedy of errors...but Warren's conviction and strong voice carry his character through the many questionable decisions that Prez makes. 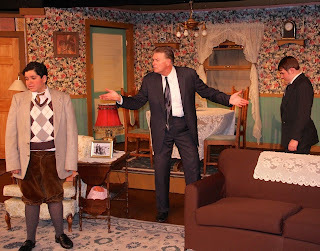 Catch the show for yourself, it runs until August 18, and tickets can be purchased online at www.musicaltheatresw.com. The immediacy of the black box environment allows you to be up close to the action, and allows for a very different viewing experience for the theater goer, check it out! The cabaret is fast becoming a regular inclusion in the Musical Theatre Southwest season, with several having appeared on last year's lineup and more scheduled next season also. 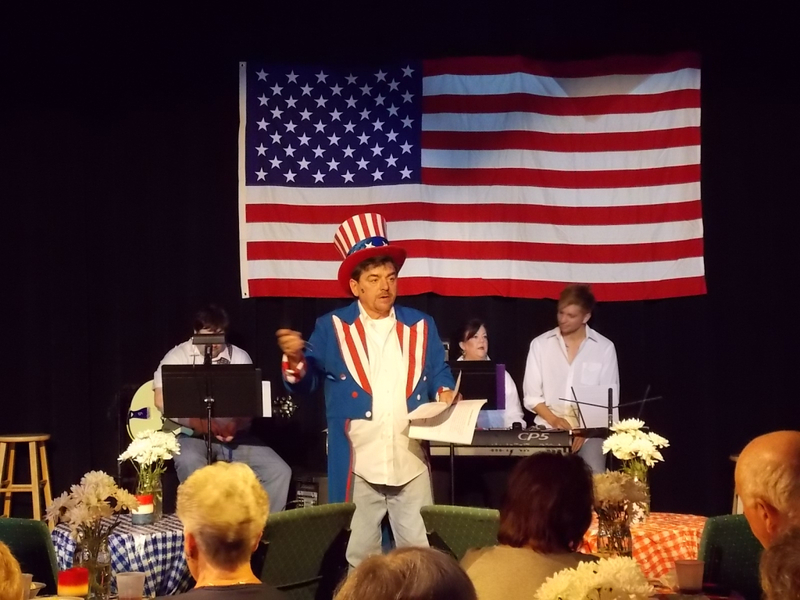 This past holiday weekend it was cabaret entertainment to be had yet again at the MTS Black Box, where the "Independence Day Cabaret" appeared. Emcee'd by the director Lee Ramey, the evening was loosely framed on the theme of "Independence," with patriotic and American-themed music numbers lining up the first act, such as audience sing-along favorites for the holiday "America the Beautiful," and "Star Spangled Banner," with accompaniment on piano by Mindy Sampson and guitar by Tim Nuzum. 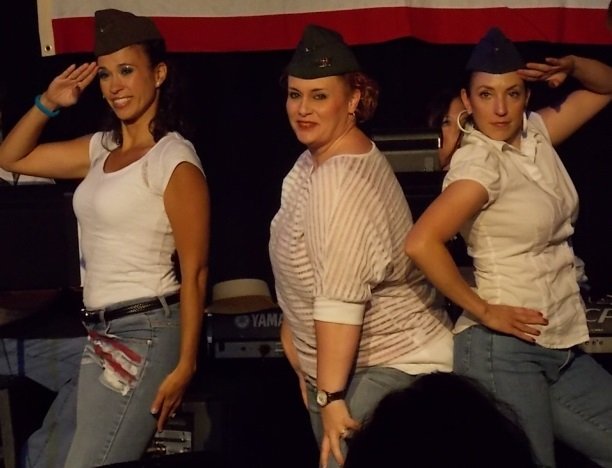 Telling our country's story, hits from the past appeared next, including Jonathan Gallegos' "Brother, Can You Spare A Dime?," a tap dance solo "Tar Star" performed by Elizabeth Rathburn, and the girls' trio "Boogie Woogie Bugle Boy," featuring Lisette Herrera, Laura Nuzum, and Stephanie Burch. More contemporary numbers, such as Patsy Cline's "Walkin' After Midnight" and the upbeat group medley "Dancin' In The Streets," also appeared in the first act. By the second act, the cast's songs and dance medleys emphasized stories with a personal sense of independence. Starting with the hippie counterculture in the "Hair" medley, to songs of personal strength and self-identity such as William Dudeck's "My Way," and Robb Sisneros' "I Am What I Am," the stories unfolding in the second half were those of self reliance, as well as the evening's overall theme of independence. And if there's a familiar face in that cast, you're right! 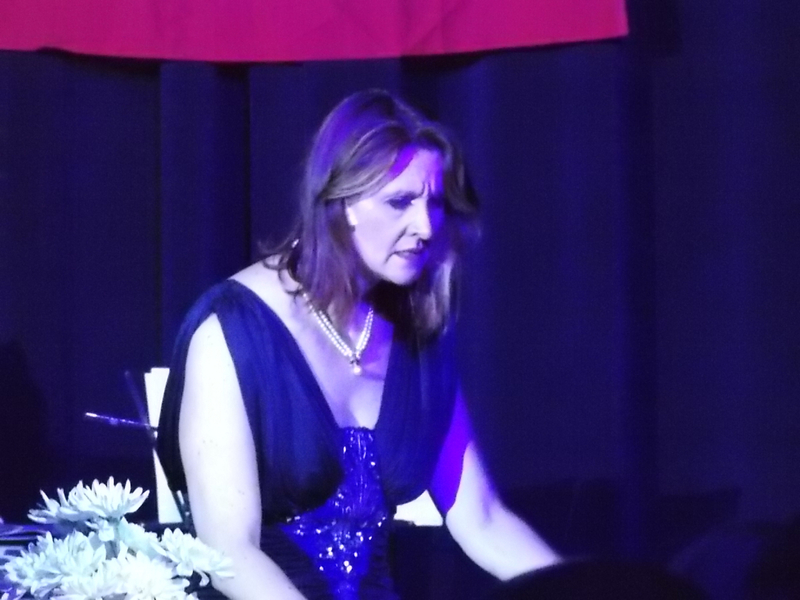 I was also part of the show, singing the solo "I Am Changing" from Dreamgirls, about evolving into a better person. 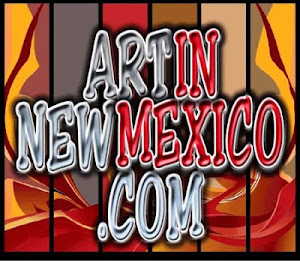 So for this blog, I can personally report how much I enjoyed being a part of the show. There's nothing like sharing the stage with people you love. 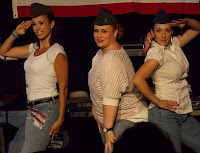 For more information about the company, check out their website at www.musicaltheatresw.com . It's a show with moxy! 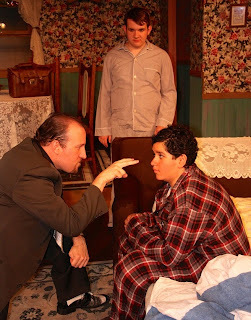 The Adobe Theater's production of Neil Simon's "Lost in Yonkers," is a semi autobiographical period piece, set in 1942 and centering around two young boys, Arty and Jay Kurnitz, who are forced to live with their rigid Grandma whom they barely know while their Father is on the road, working to pay off their debt. Thrust into this uncomfortable situation, the boys, who have the bulk of the storytelling in this show, must learn to cope with life at Grandma's. It's a huge challenge for two young actors, and both Nik Hoover (Jay Kurnitz) and Vicente Vargas (Arty Kurnitz) rise to the task of delivering their numerous lines, blocking their many scenes, and doing it all in a New York accent, while remaining likable and relatable to the audience. Ninette Mordaunt gives a tour de force performance as the German immigrant Grandma Kurnitz whose inability to express emotion affects her own grown children's ability to love, to connect and to communicate with others. "Responsibilities is what makes meanness," Grandma declares, and making her children as mean as she has had to be seems her only way of expressing affection. Also of note was Kamila Kasparian's performance as Bella, bringing a level of humanity to her dim-witted character that creates both depth and humility to the role; Bella's simplicity brings with it an emotional understanding that is beyond her other siblings to express. Directed by Heather Lovick-Tolley, the emphasis on the family dynamics and coping with difficult times is perhaps even more relevant to today's audience than it was when Simon first created it in the early 1990s. With their Dad on the road, Uncle Louie (played by Ned Record) steps in as an alternative male role model for the boys, who are both fascinated with Louie's underworld connections, even as they wonder about the wisdom of a life of organized crime. Although he sympathizes with the boys' plight, having grown up with Grandma's challenges and learned to fight her fire with his own fire, Louie's ultimate lesson from Grandma is to always take care of himself first, and so he does. Onstage, Ned finds both Uncle Louie's soft spot for his nephews, as well as his character's selfishness. The show runs until July 21 and you can visit www.adobetheatre.org for more showtimes, ticket information and more.